An electronic circuit is composed of individual electronic components, such as resistors, transistors, capacitors, inductors and diodes, connected by conductive wires or traces through which electric current can flow. To be referred to as electronic, rather than electrical, generally at least one active component must be present. The combination of components and wires allows various simple and complex operations to be performed: signals can be amplified, computations can be performed, and data can be moved from one place to another. A computer is a device that can be instructed to carry out sequences of arithmetic or logical operations automatically via computer programming. Modern computers have the ability to follow generalized sets of operations, called programs. These programs enable computers to perform an extremely wide range of tasks. A "complete" computer including the hardware, the operating system, and peripheral equipment required and used for "full" operation can be referred to as a computer system. This term may as well be used for a group of computers that are connected and work together, in particular a computer network or computer cluster. In mathematics an operand is the object of a mathematical operation, i.e. it is the object or quantity that is operated on. An integrated circuit or monolithic integrated circuit is a set of electronic circuits on one small flat piece of semiconductor material that is normally silicon. The integration of large numbers of tiny transistors into a small chip results in circuits that are orders of magnitude smaller, cheaper, and faster than those constructed of discrete electronic components. The IC's mass production capability, reliability and building-block approach to circuit design has ensured the rapid adoption of standardized ICs in place of designs using discrete transistors. ICs are now used in virtually all electronic equipment and have revolutionized the world of electronics. Computers, mobile phones, and other digital home appliances are now inextricable parts of the structure of modern societies, made possible by the small size and low cost of ICs. A peripheral or peripheral device is "an ancillary device used to put information into and get information out of the computer". In computing, a vector processor or array processor is a central processing unit (CPU) that implements an instruction set containing instructions that operate on one-dimensional arrays of data called vectors, compared to the scalar processors, whose instructions operate on single data items. Vector processors can greatly improve performance on certain workloads, notably numerical simulation and similar tasks. Vector machines appeared in the early 1970s and dominated supercomputer design through the 1970s into the 1990s, notably the various Cray platforms. The rapid fall in the price-to-performance ratio of conventional microprocessor designs led to the vector supercomputer's demise in the later 1990s. Early computers such as the ENIAC had to be physically rewired to perform different tasks, which caused these machines to be called "fixed-program computers". 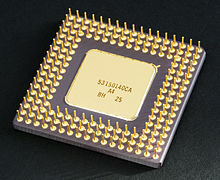 Since the term "CPU" is generally defined as a device for software (computer program) execution, the earliest devices that could rightly be called CPUs came with the advent of the stored-program computer. ENIAC was the first electronic general-purpose computer. It was Turing-complete, digital and able to solve "a large class of numerical problems" through reprogramming. A stored-program computer is a computer that stores program instructions in electronic memory. This contrasts with machines where the program instructions are stored on plugboards or similar mechanisms. John Adam Presper "Pres" Eckert Jr. was an American electrical engineer and computer pioneer. With John Mauchly, he designed the first general-purpose electronic digital computer (ENIAC), presented the first course in computing topics, founded the Eckert–Mauchly Computer Corporation, and designed the first commercial computer in the U.S., the UNIVAC, which incorporated Eckert's invention of the mercury delay line memory. John von Neumann was a Hungarian-American mathematician, physicist, computer scientist, and polymath. Von Neumann was generally regarded as the foremost mathematician of his time and said to be "the last representative of the great mathematicians"; a genius who was comfortable integrating both pure and applied sciences. The First Draft of a Report on the EDVAC is an incomplete 101-page document written by John von Neumann and distributed on June 30, 1945 by Herman Goldstine, security officer on the classified ENIAC project. It contains the first published description of the logical design of a computer using the stored-program concept, which has controversially come to be known as the von Neumann architecture. The design complexity of CPUs increased as various technologies facilitated building smaller and more reliable electronic devices. The first such improvement came with the advent of the transistor. Transistorized CPUs during the 1950s and 1960s no longer had to be built out of bulky, unreliable and fragile switching elements like vacuum tubes and relays. With this improvement more complex and reliable CPUs were built onto one or several printed circuit boards containing discrete (individual) components. IBM's System/370, follow-on to the System/360, used SSI ICs rather than Solid Logic Technology discrete-transistor modules. DEC's PDP-8/I and KI10 PDP-10 also switched from the individual transistors used by the PDP-8 and PDP-10 to SSI ICs,  and their extremely popular PDP-11 line was originally built with SSI ICs but was eventually implemented with LSI components once these became practical. While the complexity, size, construction and general form of CPUs have changed enormously since 1950,  the basic design and function has not changed much at all. Almost all common CPUs today can be very accurately described as von Neumann stored-program machines. [lower-alpha 2] As Moore's law no longer holds, concerns have arisen about the limits of integrated circuit transistor technology. Extreme miniaturization of electronic gates is causing the effects of phenomena like electromigration and subthreshold leakage to become much more significant. These newer concerns are among the many factors causing researchers to investigate new methods of computing such as the quantum computer, as well as to expand the usage of parallelism and other methods that extend the usefulness of the classical von Neumann model. Some instructions manipulate the program counter rather than producing result data directly; such instructions are generally called "jumps" and facilitate program behavior like loops, conditional program execution (through the use of a conditional jump), and existence of functions. [lower-alpha 3] In some processors, some other instructions change the state of bits in a "flags" register. These flags can be used to influence how a program behaves, since they often indicate the outcome of various operations. For example, in such processors a "compare" instruction evaluates two values and sets or clears bits in the flags register to indicate which one is greater or whether they are equal; one of these flags could then be used by a later jump instruction to determine program flow. The first step, fetch, involves retrieving an instruction (which is represented by a number or sequence of numbers) from program memory. The instruction's location (address) in program memory is determined by a program counter (PC), which stores a number that identifies the address of the next instruction to be fetched. After an instruction is fetched, the PC is incremented by the length of the instruction so that it will contain the address of the next instruction in the sequence. [lower-alpha 4] Often, the instruction to be fetched must be retrieved from relatively slow memory, causing the CPU to stall while waiting for the instruction to be returned. This issue is largely addressed in modern processors by caches and pipeline architectures (see below). The way in which the instruction is interpreted is defined by the CPU's instruction set architecture (ISA). [lower-alpha 5] Often, one group of bits (that is, a "field") within the instruction, called the opcode, indicates which operation is to be performed, while the remaining fields usually provide supplemental information required for the operation, such as the operands. Those operands may be specified as a constant value (called an immediate value), or as the location of a value that may be a processor register or a memory address, as determined by some addressing mode. One method of dealing with the switching of unneeded components is called clock gating, which involves turning off the clock signal to unneeded components (effectively disabling them). However, this is often regarded as difficult to implement and therefore does not see common usage outside of very low-power designs. One notable recent CPU design that uses extensive clock gating is the IBM PowerPC-based Xenon used in the Xbox 360; that way, power requirements of the Xbox 360 are greatly reduced. Another method of addressing some of the problems with a global clock signal is the removal of the clock signal altogether. While removing the global clock signal makes the design process considerably more complex in many ways, asynchronous (or clockless) designs carry marked advantages in power consumption and heat dissipation in comparison with similar synchronous designs. While somewhat uncommon, entire asynchronous CPUs have been built without using a global clock signal. Two notable examples of this are the ARM compliant AMULET and the MIPS R3000 compatible MiniMIPS. Related to numeric representation is the size and precision of integer numbers that a CPU can represent. In the case of a binary CPU, this is measured by the number of bits (significant digits of a binary encoded integer) that the CPU can process in one operation, which is commonly called word size, bit width, data path width, integer precision, or integer size. A CPU's integer size determines the range of integer values it can directly operate on. [lower-alpha 7] For example, an 8-bit CPU can directly manipulate integers represented by eight bits, which have a range of 256 (28) discrete integer values. To gain some of the advantages afforded by both lower and higher bit lengths, many instruction sets have different bit widths for integer and floating-point data, allowing CPUs implementing that instruction set to have different bit widths for different portions of the device. For example, the IBM System/360 instruction set was primarily 32 bit, but supported 64-bit floating point values to facilitate greater accuracy and range in floating point numbers. The System/360 Model 65 had an 8-bit adder for decimal and fixed-point binary arithmetic and a 60-bit adder for floating-point arithmetic. Many later CPU designs use similar mixed bit width, especially when the processor is meant for general-purpose usage where a reasonable balance of integer and floating point capability is required. Further improvement upon the idea of instruction pipelining led to the development of a method that decreases the idle time of CPU components even further. Designs that are said to be superscalar include a long instruction pipeline and multiple identical execution units, such as load-store units, arithmetic-logic units, floating-point units and address generation units. In a superscalar pipeline, multiple instructions are read and passed to a dispatcher, which decides whether or not the instructions can be executed in parallel (simultaneously). If so they are dispatched to available execution units, resulting in the ability for several instructions to be executed simultaneously. In general, the more instructions a superscalar CPU is able to dispatch simultaneously to waiting execution units, the more instructions will be completed in a given cycle. Both simple pipelining and superscalar design increase a CPU's ILP by allowing a single processor to complete execution of instructions at rates surpassing one instruction per clock cycle. 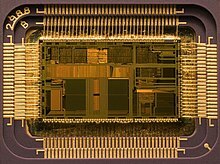 [lower-alpha 9] Most modern CPU designs are at least somewhat superscalar, and nearly all general purpose CPUs designed in the last decade are superscalar. In later years some of the emphasis in designing high-ILP computers has been moved out of the CPU's hardware and into its software interface, or ISA. The strategy of the very long instruction word (VLIW) causes some ILP to become implied directly by the software, reducing the amount of work the CPU must perform to boost ILP and thereby reducing the design's complexity. One technology used for this purpose was multiprocessing (MP). The initial flavor of this technology is known as symmetric multiprocessing (SMP), where a small number of CPUs share a coherent view of their memory system. In this scheme, each CPU has additional hardware to maintain a constantly up-to-date view of memory. By avoiding stale views of memory, the CPUs can cooperate on the same program and programs can migrate from one CPU to another. To increase the number of cooperating CPUs beyond a handful, schemes such as non-uniform memory access (NUMA) and directory-based coherence protocols were introduced in the 1990s. SMP systems are limited to a small number of CPUs while NUMA systems have been built with thousands of processors. Initially, multiprocessing was built using multiple discrete CPUs and boards to implement the interconnect between the processors. When the processors and their interconnect are all implemented on a single chip, the technology is known as chip-level multiprocessing (CMP) and the single chip as a multi-core processor. A less common but increasingly important paradigm of processors (and indeed, computing in general) deals with data parallelism. The processors discussed earlier are all referred to as some type of scalar device. [lower-alpha 10] As the name implies, vector processors deal with multiple pieces of data in the context of one instruction. This contrasts with scalar processors, which deal with one piece of data for every instruction. Using Flynn's taxonomy, these two schemes of dealing with data are generally referred to as single instruction stream, multiple data stream (SIMD) and single instruction stream, single data stream (SISD), respectively. The great utility in creating processors that deal with vectors of data lies in optimizing tasks that tend to require the same operation (for example, a sum or a dot product) to be performed on a large set of data. Some classic examples of these types of tasks include multimedia applications (images, video and sound), as well as many types of scientific and engineering tasks. Whereas a scalar processor must complete the entire process of fetching, decoding and executing each instruction and value in a set of data, a vector processor can perform a single operation on a comparatively large set of data with one instruction. This is only possible when the application tends to require many steps which apply one operation to a large set of data. Cloud computing can involve subdividing CPU operation into virtual central processing units  (vCPUs  ). A host is the virtual equivalent of a physical machine, on which a virtual system is operating. When there are several physical machines operating in tandem and managed as a whole, the grouped computing and memory resources form a cluster. In some systems, it is possible to dynamically add and remove from a cluster. Resources available at a host and cluster level can be partitioned out into resources pools with fine granularity. The performance or speed of a processor depends on, among many other factors, the clock rate (generally given in multiples of hertz) and the instructions per clock (IPC), which together are the factors for the instructions per second (IPS) that the CPU can perform. Many reported IPS values have represented "peak" execution rates on artificial instruction sequences with few branches, whereas realistic workloads consist of a mix of instructions and applications, some of which take longer to execute than others. The performance of the memory hierarchy also greatly affects processor performance, an issue barely considered in MIPS calculations. Because of these problems, various standardized tests, often called "benchmarks" for this purpose‍—‌such as SPECint ‍—‌have been developed to attempt to measure the real effective performance in commonly used applications. Processing performance of computers is increased by using multi-core processors, which essentially is plugging two or more individual processors (called cores in this sense) into one integrated circuit. Ideally, a dual core processor would be nearly twice as powerful as a single core processor. In practice, the performance gain is far smaller, only about 50%, due to imperfect software algorithms and implementation. Increasing the number of cores in a processor (i.e. dual-core, quad-core, etc.) increases the workload that can be handled. This means that the processor can now handle numerous asynchronous events, interrupts, etc. which can take a toll on the CPU when overwhelmed. These cores can be thought of as different floors in a processing plant, with each floor handling a different task. Sometimes, these cores will handle the same tasks as cores adjacent to them if a single core is not enough to handle the information. ↑ The so-called "von Neumann" memo expounded the idea of stored programs,  which for example may be stored on punched cards, paper tape, or magnetic tape. Processor design is the design engineering task of creating a processor, a component of computer hardware. It is a subfield of computer engineering and electronics engineering (fabrication). The design process involves choosing an instruction set and a certain execution paradigm and results in a microarchitecture, which might be described in e.g. VHDL or Verilog. For microprocessor design, this description is then manufactured employing some of the various semiconductor device fabrication processes, resulting in a die which is bonded onto a chip carrier. This chip carrier is then soldered onto, or inserted into a socket on, a printed circuit board (PCB). The Intel 8088 microprocessor is a variant of the Intel 8086. Introduced on July 1, 1979, the 8088 had an eight-bit external data bus instead of the 16-bit bus of the 8086. The 16-bit registers and the one megabyte address range were unchanged, however. In fact, according to the Intel documentation, the 8086 and 8088 have the same execution unit (EU)—only the bus interface unit (BIU) is different. The original IBM PC was based on the 8088. A floating-point unit is a part of a computer system specially designed to carry out operations on floating point numbers. Typical operations are addition, subtraction, multiplication, division, square root, and bitshifting. Some systems can also perform various transcendental functions such as exponential or trigonometric calculations, though in most modern processors these are done with software library routines. A superscalar processor is a CPU that implements a form of parallelism called instruction-level parallelism within a single processor. In contrast to a scalar processor that can execute at most one single instruction per clock cycle, a superscalar processor can execute more than one instruction during a clock cycle by simultaneously dispatching multiple instructions to different execution units on the processor. It therefore allows for more throughput than would otherwise be not possible at a given clock rate. Each execution unit is not a separate processor, but an execution resource within a single CPU such as an arithmetic logic unit. Very long instruction word (VLIW) refers to instruction set architectures designed to exploit instruction level parallelism (ILP). Whereas conventional central processing units mostly allow programs to specify instructions to execute in sequence only, a VLIW processor allows programs to explicitly specify instructions to execute in parallel. This design is intended to allow higher performance without the complexity inherent in some other designs. In the history of computer hardware, some early reduced instruction set computer central processing units used a very similar architectural solution, now called a classic RISC pipeline. Those CPUs were: MIPS, SPARC, Motorola 88000, and later the notional CPU DLX invented for education. The UltraSPARC is a microprocessor developed by Sun Microsystems and fabricated by Texas Instruments, introduced in mid-1995. It is the first microprocessor from Sun to implement the 64-bit SPARC V9 instruction set architecture (ISA). Marc Tremblay was a co-microarchitect. The Emotion Engine is a central processing unit developed and manufactured by Sony Computer Entertainment and Toshiba for use in the PlayStation 2 video game console. It was also used in early PlayStation 3 models sold in Japan and North America to provide PlayStation 2 game support. Mass production of the Emotion Engine began in 1999 and ended in late 2012 with the discontinuation of the PlayStation 2. The POWER1 is a multi-chip CPU developed and fabricated by IBM that implemented the POWER instruction set architecture (ISA). It was originally known as the RISC System/6000 CPU or, when in an abbreviated form, the RS/6000 CPU, before introduction of successors required the original name to be replaced with one that used the same naming scheme (POWERn) as its successors in order to differentiate it from the newer designs. In computer engineering, microarchitecture, also called computer organization and sometimes abbreviated as µarch or uarch, is the way a given instruction set architecture (ISA) is implemented in a particular processor. A given ISA may be implemented with different microarchitectures; implementations may vary due to different goals of a given design or due to shifts in technology. 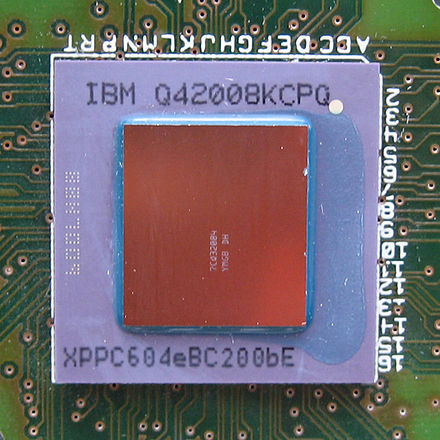 The POWER4 is a microprocessor developed by International Business Machines (IBM) that implemented the 64-bit PowerPC and PowerPC AS instruction set architectures. Released in 2001, the POWER4 succeeded the POWER3 and RS64 microprocessors, and was used in RS/6000 and AS/400 computers, ending a separate development of PowerPC microprocessors for the AS/400. The POWER4 was a multicore microprocessor, with two cores on a single die, the first non-embedded microprocessor to do so. POWER4 Chip was first commercially available multiprocessor chip. The original POWER4 had a clock speed of 1.1 and 1.3 GHz, while an enhanced version, the POWER4+, reached a clock speed of 1.9 GHz. The PowerPC 970 is a derivative of the POWER4. The Fujitsu FR-V is one of the very few processors ever able to process both a very long instruction word (VLIW) and vector processor instructions at the same time, increasing throughput with high parallel computing while increasing performance per watt and hardware efficiency. The family was presented in 1999. Its design was influenced by the VPP500/5000 models of the Fujitsu VP/2000 vector processor supercomputer line. Scalar processors represent a class of computer processors. A scalar processor processes only one data item at a time, with typical data items being integers or floating point numbers. A scalar processor is classified as a SISD processor in Flynn's taxonomy. The R4000 is a microprocessor developed by MIPS Computer Systems that implements the MIPS III instruction set architecture (ISA). Officially announced on 1 October 1991, it was one of the first 64-bit microprocessors and the first MIPS III implementation. In the early 1990s, when RISC microprocessors were expected to replace CISC microprocessors such as the Intel i486, the R4000 was selected to be the microprocessor of the Advanced Computing Environment (ACE), an industry standard that intended to define a common RISC platform. ACE ultimately failed for a number of reasons, but the R4000 found success in the workstation and server markets. The history of general-purpose CPUs is a continuation of the earlier history of computing hardware. Gekko is a superscalar out-of-order 32-bit PowerPC microprocessor custom-made by IBM in 2000 for Nintendo to use as the CPU in their sixth generation game console, the Nintendo GameCube, and later the Triforce Arcade Board. 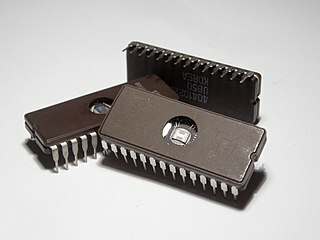 The z196 microprocessor is a chip made by IBM for their zEnterprise 196 and zEnterprise 114 mainframe computers, announced on July 22, 2010. The processor was developed over a three-year time span by IBM engineers from Poughkeepsie, New York; Austin, Texas; and Böblingen, Germany at a cost of US$1.5 billion. Manufactured at IBM's Fishkill, New York fabrication plant, the processor began shipping on September 10, 2010. IBM stated that it was the world's fastest microprocessor at the time. The IBM POWER ISA is a reduced instruction set computer (RISC) instruction set architecture (ISA) developed by IBM. The name is an acronym for Performance Optimization With Enhanced RISC. ↑ Regan, Gerard (2008). A Brief History of Computing. p. 66. ISBN 978-1848000834 . Retrieved 26 November 2014. ↑ "ENIAC's Birthday". The MIT Press. February 9, 2016. Retrieved October 17, 2018. ↑ "Section 250: Microprocessors and Toys: An Introduction to Computing Systems". The University of Michigan. Retrieved October 9, 2018. ↑ White, Stephen. "A Brief History of Computing - First Generation Computers" . Retrieved November 21, 2015. ↑ "Introducing the Vacuum Transistor: A Device Made of Nothing". IEEE Spectrum. 2014-06-23. Retrieved 27 January 2019. ↑ What Is Computer Performance?. The National Academies Press. 2011. doi:10.17226/12980. ISBN 978-0-309-15951-7 . Retrieved May 16, 2016. ↑ "IBM System/360 Dates and Characteristics". IBM. 2003-01-23. ↑ Lilly, Paul (2009-04-14). "A Brief History of CPUs: 31 Awesome Years of x86". PC Gamer. Retrieved June 15, 2016. 1 2 Patterson, David A.; Hennessy, John L.; Larus, James R. (1999). Computer Organization and Design: the Hardware/Software Interface (2. ed., 3rd print. ed.). San Francisco: Kaufmann. p. 751. ISBN 978-1558604285. ↑ "1962: Aerospace systems are first the applications for ICs in computers". Computer History Museum . Retrieved October 9, 2018. ↑ "The integrated circuits in the Apollo manned lunar landing program". National Aeronautics and Space Administration. Retrieved October 9, 2018. ↑ "System/370 Announcement". IBM Archives. 2003-01-23. Retrieved October 25, 2017. ↑ "System/370 Model 155 (Continued)". IBM Archives. 2003-01-23. Retrieved October 25, 2017. ↑ Ross Knox Bassett (2007). To the Digital Age: Research Labs, Start-up Companies, and the Rise of MOS Technology. The Johns Hopkins University Press. pp. 127–128, 256, and 314. ISBN 978-0-8018-6809-2. ↑ "LSI-11 Module Descriptions" (PDF). LSI-11, PDP-11/03 user's manual (2nd ed.). Maynard, Massachusetts: Digital Equipment Corporation. November 1975. pp. 4–3. ↑ Osborne, Adam (1980). An Introduction to Microcomputers. Volume 1: Basic Concepts (2nd ed.). Berkeley, California: Osborne-McGraw Hill. ISBN 978-0-931988-34-9. ↑ Zhislina, Victoria (2014-02-19). "Why has CPU frequency ceased to grow?". Intel. Retrieved October 14, 2015. ↑ Eigenmann, Rudolf; Lilja, David (1998). "Von Neumann Computers" (PDF). Retrieved June 15, 2018. ↑ Aspray, William (September 1990). "The stored program concept". IEEE Spectrum. Vol. 27 no. 9. doi:10.1109/6.58457. ↑ Gottlieb, Allan; Almasi, George S. (1989). Highly parallel computing. Redwood City, Calif.: Benjamin/Cummings. ISBN 978-0-8053-0177-9. ↑ Flynn, M. J. (September 1972). "Some Computer Organizations and Their Effectiveness". IEEE Trans. Comput. C-21 (9): 948–960. doi:10.1109/TC.1972.5009071. ↑ Lu, N.-P.; Chung, C.-P. (1998). "Parallelism exploitation in superscalar multiprocessing". IEE Proceedings - Computers and Digital Techniques. Institution of Electrical Engineers. 145 (4): 255. doi:10.1049/ip-cdt:19981955. ↑ Anjum, Bushra; Perros, Harry G. (2015). "1: Partitioning the End-to-End QoS Budget to Domains". Bandwidth Allocation for Video Under Quality of Service Constraints. Focus Series. John Wiley & Sons. p. 3. ISBN 9781848217461 . Retrieved 2016-09-21. [...] in cloud computing where multiple software components run in a virtual environment on the same blade, one component per virtual machine (VM). Each VM is allocated a virtual central processing unit [...] which is a fraction of the blade's CPU. ↑ Fifield, Tom; Fleming, Diane; Gentle, Anne; Hochstein, Lorin; Proulx, Jonathan; Toews, Everett; Topjian, Joe (2014). "Glossary". OpenStack Operations Guide. Beijing: O'Reilly Media, Inc. p. 286. ISBN 9781491906309 . Retrieved 2016-09-20. Virtual Central Processing Unit (vCPU)[:] Subdivides physical CPUs. Instances can then use those divisions. Wikimedia Commons has media related to Microprocessors .